As long as you exclude yard work, car washing, house chores, etc. 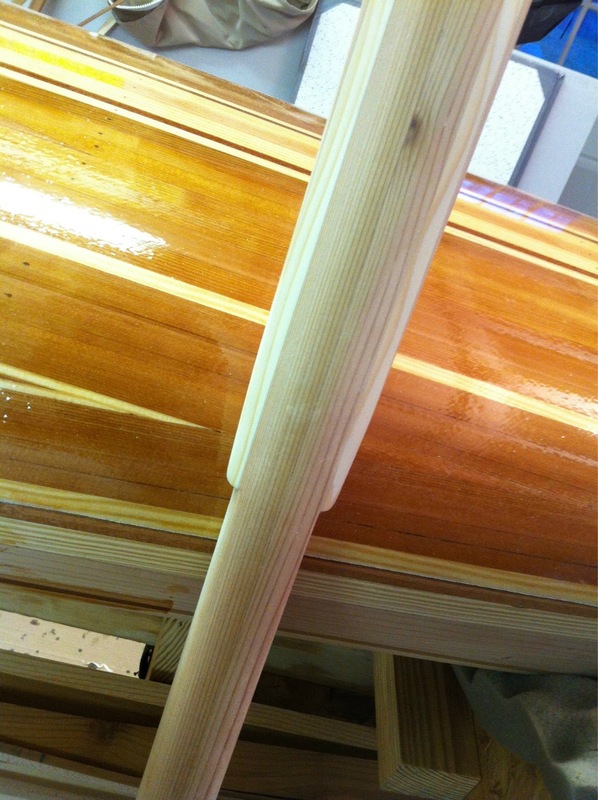 (or anything else you don’t want to do) it is good to have small tasks to fill in the wait while your epoxy cures. I decided my new boat needed her own paddle. I prefer a Greenland style to a Euro. Greens are much easier on the shoulders, can have lower windage punching to windward, and just feel so much nicer slicing through the water. You can actually “throttle” the blade’s drive in the water. They also have a grace missing from the Euros I think. Additionally, you separate yourself further from the plastic rotomolded riff-raff. You may fly over the waterfall into oblivion, but darned if you don’t look good doing it! This is actually my 3rd attempt at paddle making. 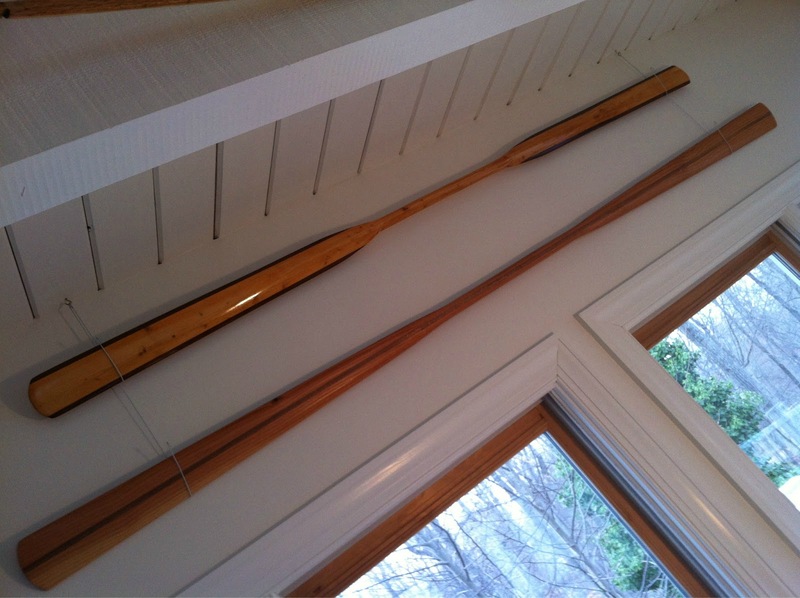 The first was hacked out of a knotty white pine 2×4. It was to be practice and never to see the light of day, but it turned out to be quite functional. 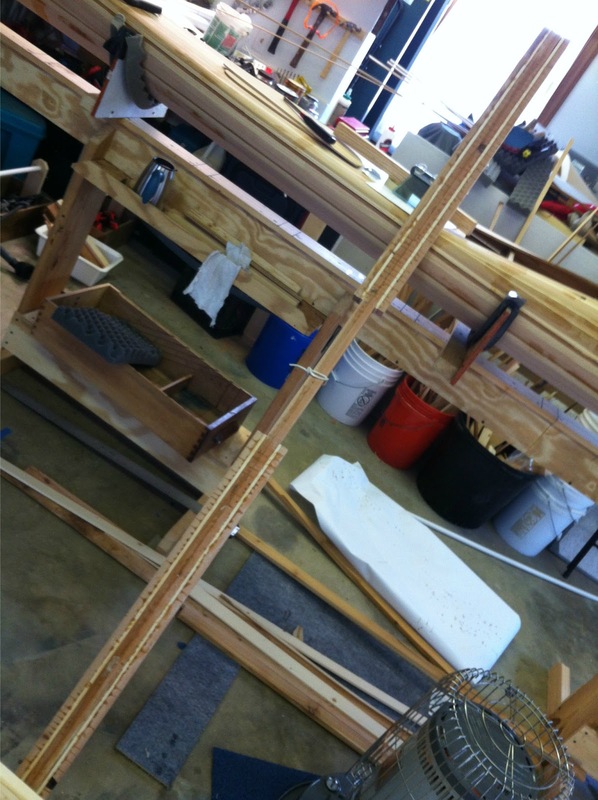 Coating the loom (center grab area) with polyurethane (or varnish)was a mistake as the coating promotes blisters. I say hacked, because this was before I read up on the proper tuning of a block plane. I assumed a brand new plane was sharp. I fairly bludgeoned the stick to compliance and had to trim the edges in mahogany to cover major errors. 1st at top. 2nd at bottom. 1st & 2nd up close. Not too discouraged, I happened to see a nice stud grade spruce 2×4 lying in the rack at the big box home store and snagged it for $1.75. With a sharpened plane, this go was much more to my liking. It is finished with a soup of equal; parts pine tar, mineral spirits and linseed oil. Stinks, but the smell grows on you, and perhaps becomes a part of you. 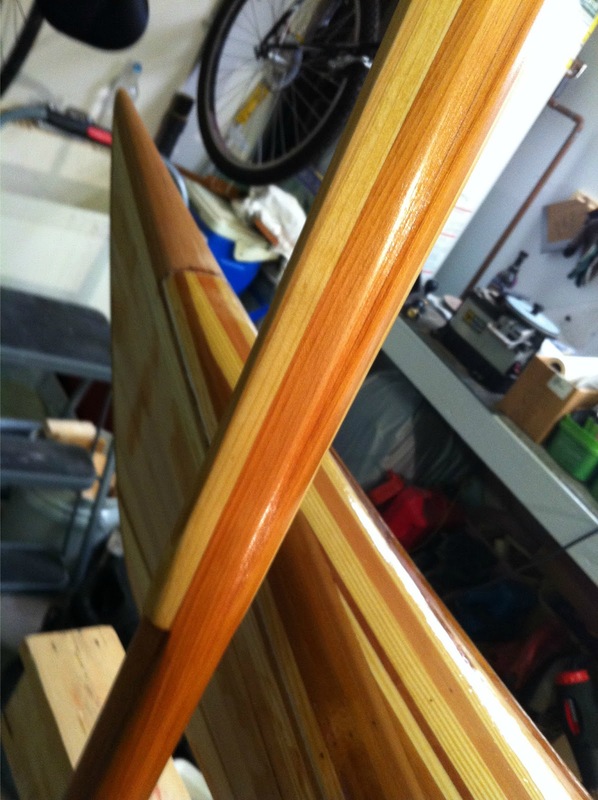 There is a spline of mahogany epoxied on this one. Weight: 2 lbs 10 oz. and straight. Now to #3: I wanted a nicer and hopefully lighter paddle. 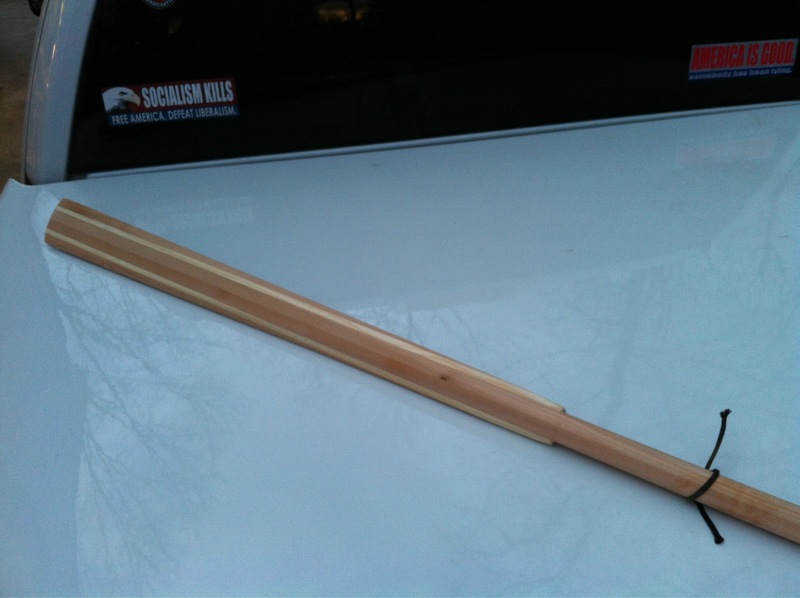 I also added an inch to the previous 87″ stick. 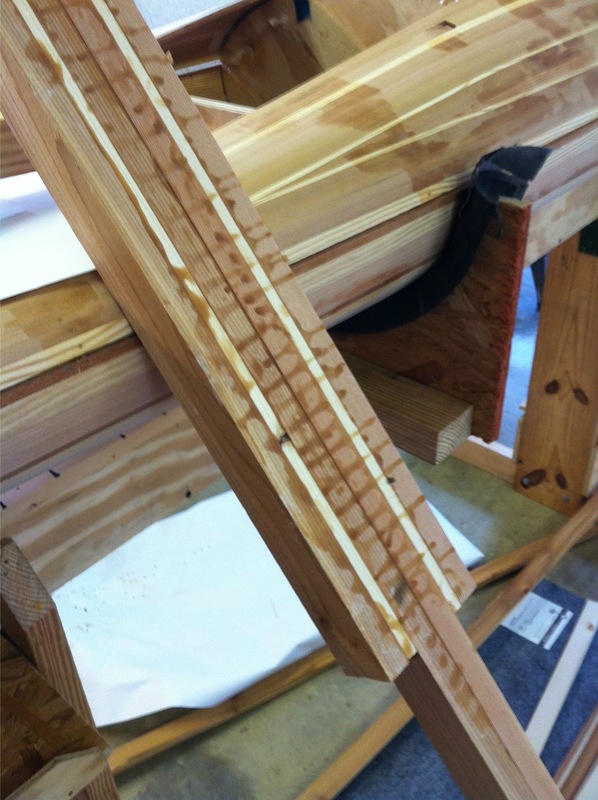 Strips of 3/4″ x 1 1/2″ western red cedar is laminated with Titebond III waterproof glue to 3/8″ x 1 1/2″ sugar pine to approximate the overall shape at 6 pounds. round 3 in the rough. There are some knots I expect to be removed in the shaping process. Paddle is over 6 lbs at this point. Heavy. Glue seems to be super hard and leaving a scrap in a cup of water showed no glue discoloration or softening. Certainly less expensive than epoxy. 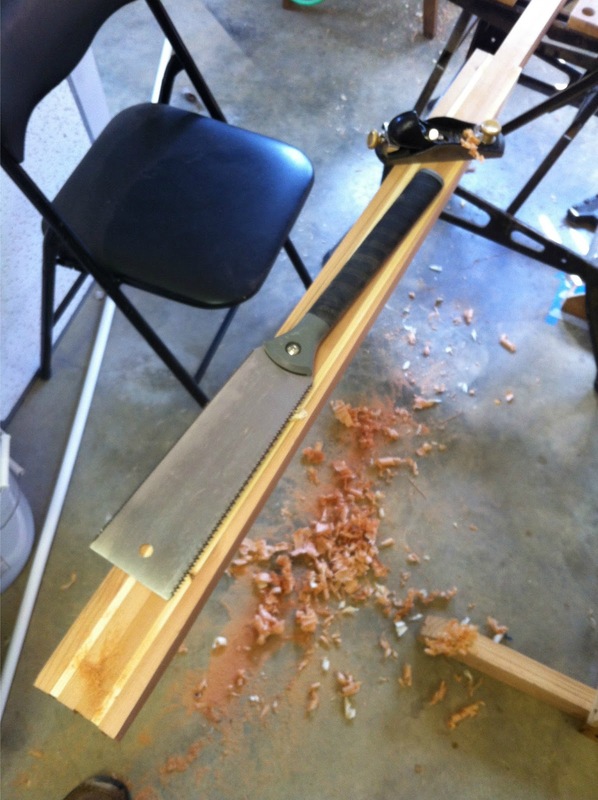 The drips were scraped and the whole assembly run through my old Ryobi 10″ surfacing planer to 1 7/16″ thickness. At this point it more represents a frat paddle. “thank you sir! may I have another? !” you either know the reference, or you don’t. If not, consider yourself lucky. Now the the real shaping begins. The edges were cut with a Japanese saw. I used a circular saw on the flats. My Workmate portable bench secures things well. 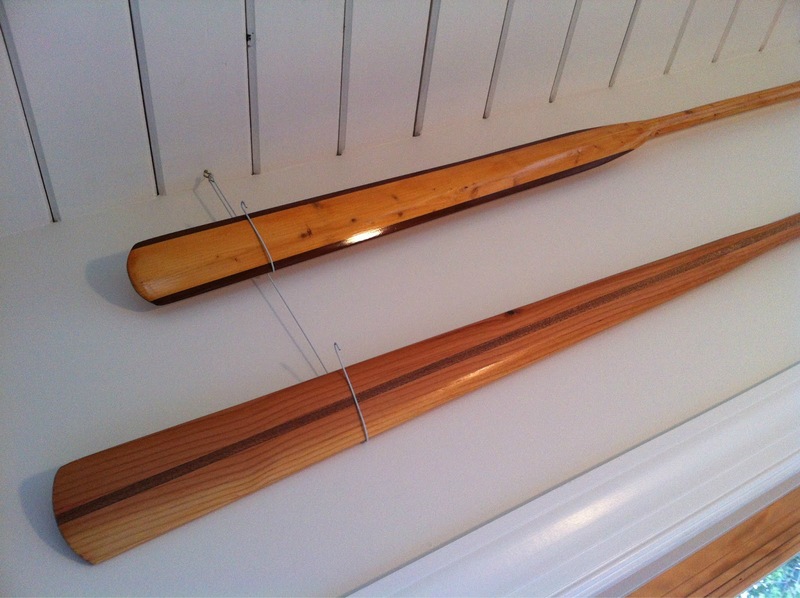 Use scraps of wood in the jaws to avoind dinging the paddle itself. Cedar is soft. The hand plane trims the cuts to a fair line. 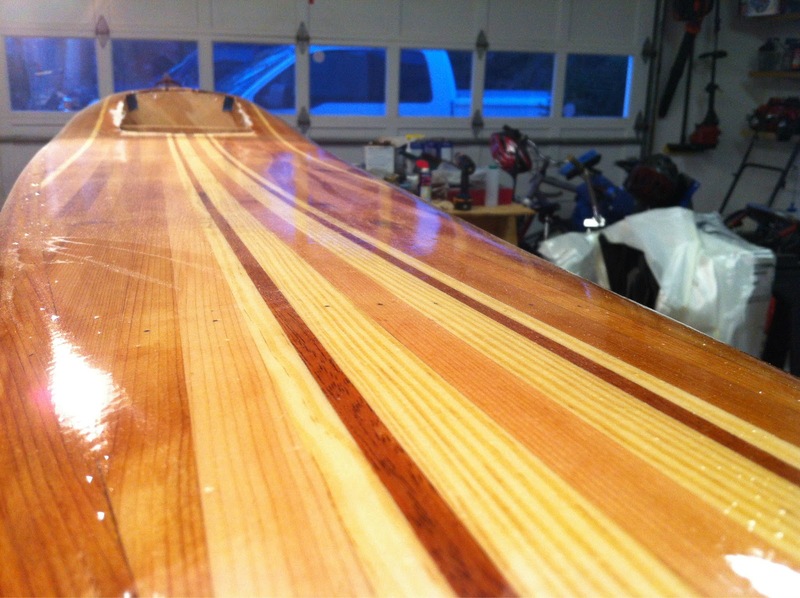 # 3 sanded & ready for the “soup”. At 2 lbs and 10 oz, this third try weighs a whole pound less than #2. I may have to test it out this weekend. The blades are thinner and should slice the water better. The site below notes less turbulence with a more oval cross section than a flat or squarish section. Mine is between the two for quick execution. We’ll see how it compares to #2 which is more “flat”. In the meantime a coat of soup will be applied everyday. I just slop it on with a clean rag, let it soak in for an hour or two, wipe off any drips, and re-coat in 6-8 hours. Saw THIS this morning. The pain of those blips are starting to melt away. After a few coats of varnish, I expect the exasperation will be gone. I have it on good report from Barry Long that these blemishes will fade as the varnish (not applied yet) and wood darken. I trust he’s correct and welcomed the comment.